First, recreate French style living with designer Kathryn Ireland for a rustic and charming vibe in your home (Watch video below). Next, go behind the doors of a magnificent French provincial estate in beautiful Lake Forest, IL (Watch video below). Then, tour the Elle Decor Modern Life Concept House with some very talented designers (Watch video below). Later, we couldn't get enough of French design and architecture, so we got an exclusive look at a $55 million French Palladian estate on Sunset Boulevard called Palais des Anges--it's European elegance at its finest (Watch video above). Finally, designer Libby Langdon transforms an outdated eighties living into a retro modern chic space (Watch video here). 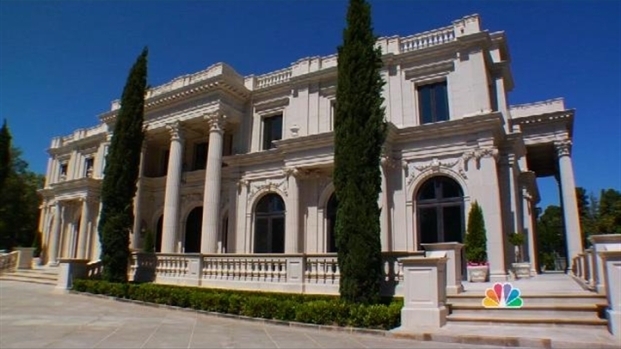 Brokers Jade Mills and Joyce Rey tour us through the $55 million dollar French Palladian estate on Sunset Blvd in Beverly Hills called Palais des Anges. It took the homeowners five years to create this epitome of European elegance. The exterior is made from imported limestone that’s been hand carved and there's ornate detailing throughout reminiscent of Hearst Castle. Features include a two-story grand marble entrance, library, dining room, breakfast room, salon, living room, gourmet kitchen, casual family room, mastersuite and a veranda which overlooks the almost two acres of perfectly manicured grounds that include, fruit trees, a 40 foot pool, tennis court, guest house, and cabanas. This is a home that encompasses the finer things in life. For more information on this property please contact Coldwell Banker brokers Jade Mills at 310-285-7508 and Joyce Rey at 310-285-7529. View the listing.